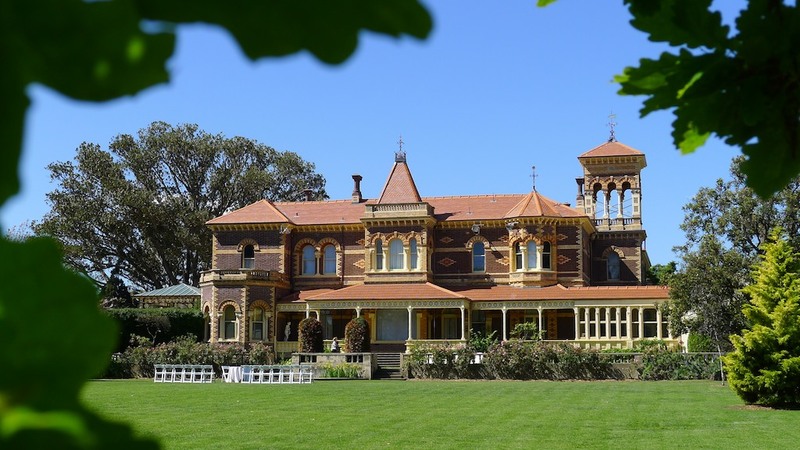 Rippon Lea – another in the ‘Haven’t you been there yet?’ places now ticked off our to-do list! Frederick Sargood certainly left a fantastic mansion and beautifully designed grounds. The whole of the estate is currently managed by the National Trust. The prompt for this visit was the current exhibition of some of the costumes used in Miss Fishers Murder Mysteries. The second of the TV series based on the books by Kerry Greenwood is currently being shown on ABC1 of a Friday night – the traditional who-dunnit time slot. Rippon Lea is used in a number of the television episodes as different locations, depending on which part view of the mansion is being filmed. Very clever. Also, I would say, the reason, why the costumes are being exhibited there. We chose to visit on a Saturday, which meant we a) had a chance at parking within 1km of the entrance gate and b) were able to wander into the mansion to see the costumes when we arrived, instead of being allocated a set entry time. Had we gone the following day, when Kerry Greenwood was attending a high tea there, I can only imagine the nightmare that parking would have been and battling the crowds that came to flood the mansion and grounds to see her and the costumes – despite the prediction of showers through the day. I’m a fan of the books and TV series… but I’m quite averse to crowds. Not unexpectedly, photography was not allowed inside the mansion, but believe me when I say the place is very grand. The photos on the website are better than mine would have been anyway. As for the costumes (mostly gowns and hats for the lead character, Miss Phryne Fisher), it was very interesting to see them up close. To really appreciate them as fashion though, watch the TV series! We re-emerged into a bright sunny (warm!) day to explore the grounds. I’d been told that Rippon Lea is a popular location for weddings and I have now seen exactly why. We wandered around, exploring the different areas of the grounds – the fernery, orchard, windmill, the ponds/lakes, and yet we didn’t see everything. I guess we’ll just have to go back again! With a picnic next time! Categories: Victoria, Weekend Drives | Tags: Australian Painted Lady, Butterflies, Dingy Swallowtail, Dragon Blood Tree, Mansion, Melbourne, Miss Fisher's Murder Mysteries, National Trust, Phryne Fisher, Rippon Lea, spring, Spring blossoms | Permalink. “Again?” I hear you ask. Yes, I’m afraid so. But stick with me; it’s a short post (which is how it’s jumped ahead of a couple of others) and it’ll be our last visit to the National Rhododendron Gardens for a while, I think. As beautiful and ever-changing as the gardens are, I think after this trip we can tick the box that says ‘Done’ for now. We didn’t think we could tick that box off before for two reasons: 1) last trip we were too early for the cherry blossoms and 2) we also hadn’t seen the rhododendrons in flower! Well, no more dear people! Feast you eyes upon these photos and sigh (possibly with relief) for there are cherry blossoms (though not nearly quite as many as we had imagined), rhododendrons (many more than we had imagined) and other flowers brightening the park with colour everywhere you care to look! Not previously being very familiar with rhododendrons, I was thinking to myself that a lot of them looked quite like azaleas. It turns out that azaleas are of the genus Rhododendron! That would explain it. Categories: Victoria, Weekend Drives | Tags: Azaleas, Camellias, Cherry blossoms, Dandenong Ranges, Day Trip, Flowers, Melbourne, National Rhododendron Gardens, Olinda, Parks Victoria, photography, protea, Rhododendron, spring, Weekend drive | Permalink.